Musician entrepreneurs need to be building four specific things. What are they? I wouldn’t be surprised if your answered “businesses” or “music careers”. These are not wrong answers, but you won’t find them on this list, because they are practically a given. It’s important to be focused on doing the right things, because there are only a few things that will increase in value over time, and unless you invest in those thing, you could end your career and/or life with a great deal of regret. 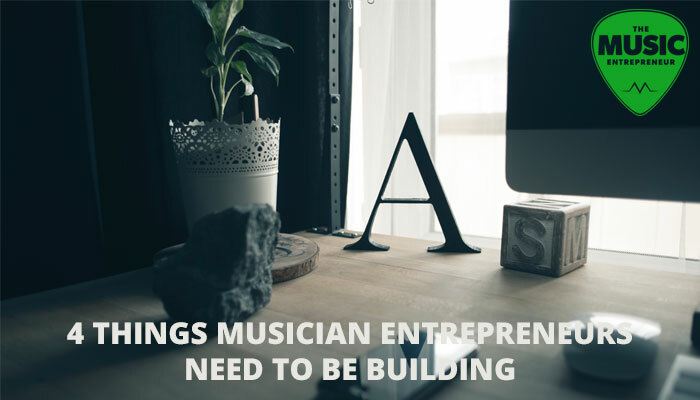 Here are four things musician entrepreneurs need to be building. Before I get into this, first, forget everything you’ve ever heard about assets. Most of what people call an asset is actually a liability, such as a car, a boat, or a home. These items might factor into your personal net worth, but you should not look at them as assets. They depreciate in value over time. To an entrepreneur, an asset is anything that produces ongoing (and preferably increasing) returns without their constant involvement. Businesses. If you own a business, and it produces income without your constant monitoring, it can definitely be considered an asset. Investments. Again, most investments people call “sure bets” – like mutual funds – have an incredibly low success rate. If you really want to learn the ins and outs of investing, read a book like Tony Robbins’ MONEY Master The Game: 7 Simple Steps to Financial Freedom (buy it on Amazon), which is a great book, but a really long and sometimes difficult read. Property. This includes intellectual property, which is good news for musicians (your music is a form of property). Of course, real estate and land also fall under this category. Does creating an asset sound like a lot of hard work? It should, and that’s why most people never create any passive streams of income. But keep in mind that – even if you don’t get into business or investing – music is an asset that can be leveraged to help you create many streams of revenue. The main thing is to figure out how you can re-purpose the work you’ve already produced, and continue to build a deep catalogue of material, as every song is a new opportunity. Whatever you choose to focus on, building assets should be one of your highest priorities. There’s a difference between how employees think and how entrepreneurs think. Employees work for money and for other people. If they’re particularly ambitious, they might look for ways to get paid more money per hour or per year, or negotiate commissions on sales. Entrepreneurs have money and people work for them. They’re lazily ambitious, so they’re more interested in setting up teams and systems than in figuring out how much money they can squeeze out of an hour. People with artistic tendencies try to do everything themselves. Ultimately it doesn’t matter whether you’re employee-minded or entrepreneur-minded – this usually works against you. You can get a lot more done with the help of a team. Plus, really smart, talented people typically like to be in-demand and tasked with a lot of to-do items. As the saying goes, if you want something done, ask a busy person to do it. You’re probably wondering how you can have things run on autopilot when you have a team to manage. This is where systems come into play. Now, when I say “autopilot”, I don’t mean that you won’t at least have some maintenance work to do. I don’t know of any business models that allow for that much flexibility. But when you have processes, procedures and policies in place for your employees, and they understand them and know how to follow them, you have a company that can function without you. Systems can also work on a personal level. For example, you could create a checklist for yourself on what to post to social media and when. That way, you won’t forget about any sites you’re trying to build a presence on, and you’ll be able to build consistency and momentum over time. You could also map out a morning routine, or have a specific way of taking notes on the books you read. You can create systems for just about anything, up to and including creative activities. Your habits form your future, and you can reinforce them through personal systems. This makes you an excellent leader too. Last but certainly not least, you should be building yourself. Reading. Novels might be entertaining and fun to read, but your true growth is going to come from leadership books, business books, personal development books, biographies of successful individuals, and the like. You might recall that I have a recommended reading list I linked to earlier. Listening to podcasts and audio programs. And yes, you can listen to audiobooks as well, but you shouldn’t use them to replace physical books (or eBooks, as the case may be). If you’re a real go-getter, you will get into the habit of reading and listening to challenging, value-adding material. Watching videos. Videos and DVD programs can also be beneficial for your growth. If you’re a visual learner, or if the material can only be learned visually, then videos can have considerable value. Mentorship. Do you have people in your life that have achieved things you would like to, but haven’t? Getting their perspective on things and sharing in your challenges is invaluable. A good mentor will guide you when you’re lost, but just remember – you have to initiate. A good mentor won’t start dishing out advice without prompting. Conferences, events, workshops, etc. Conferences and events provide opportunities for you to get away from your usual environment, connect with new and different people, and maybe even learn some new things. Beware: everything has a way of becoming trite and comfortable after a certain point. I would encourage you to continue to challenge yourself over time. Read books that stretch your mind, talk to mentors that expand your vision, listen to audio that challenges your point of view, and so on. Now you know exactly what you should be building. Take some time to think about what you’re building right now. Does any of it fall under one of the categories already mentioned? Are you building assets, teams, systems, or yourself? Do you have clearly defined goals for your future? Do you know what you’re aiming at? If you are, congrats! If you not, that’s okay, but you may want to give this more thought. 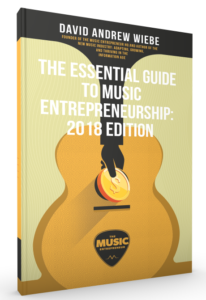 Is there anything else you think a musician entrepreneur should be building?